2 What Is Forex and How to Start Trading in Forex Market? 3 What is Binary Options Trading and How to Start? 4 Is Binary Options Trading Gambling? 5.1 When Am I Ready for Binary Options Real Trading ? Starting as an amateur, Binary Options is a kind of online trading based on Forex market. This term contains excessive information that can’t be explained in a few words. Basically, Binary Option can be explained as way of online investment for a fixed return with an expiration period, which is also fixed. It has gained huge popularity in the last couple of years mainly because its simplicity and appeal toward the general public. To understand it first you should know Forex market. What Is Forex and How to Start Trading in Forex Market? Forex means Foreign Exchange, in the Forex market you will buy/sell currencies. This is common description about Forex Market but today Forex market trading is the kind of online trading. Some companies offer you to trade in Forex market and the traders call them Forex Brokers. Forex is like Stocks market. Today a lot of Forex Brokers offer their clients trading on Stocks, Energies and metal markets too. Just like stocks markets in Forex market, you can trade currency based on what you get about the currency value, but the main difference with Forex is that you can trade sell or buy just as easily. If your prediction is a currency which will increase in value, you can buy it. If you think it will decrease, you can sell it. On Forex market you should choose symbols for trading. You can’t buy one currency and exchange it to your desire currency. For example you can’t Buy GBP (British Pound) and convert it to AUD (Australian dollar), JPY (Japanese Yen), and Or USD (Us Dollar). For instance you choose EURUSD for trading. It means that if you buy EUR/USD, you should convert it to USD when you decide to sell your EURO. You are not allowed to change it to GBP or JPY. When you choose your desire symbol to trade, you have 2 options for trading Buy/Sell. If you think EUR value will decrease against USD, you can sell EUR/USD and if you think EUR value will increase against USD, you can buy EUR/USD. What is Binary Options Trading and How to Start? 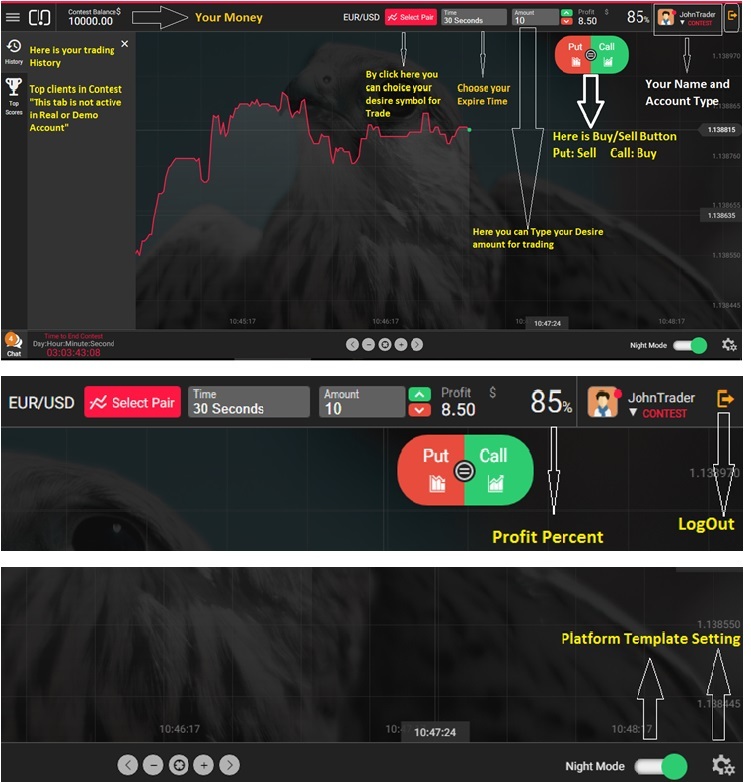 On binary options, you can trade on Forex symbols like EURUSD or GBPUSD or USDCHF but you should predict the market directions only it looks like bet on the Forex market! On Binary Options we say Call orders and Put orders. In fact call on Binary Options means buy and Put means sell. On Forex market you can hold your positions (orders) for long time and close it every time that you like. But On Binary Options you have expire time. You can’t close or modify your orders till expire time.2- On Forex market your profit and lose is variable and depend on market movement But in Binary Options your profit and lose is fix. The Binary brokers offer you fixed return if you guess market movement correctly. For example CloseOption.com offer you up to 85% on EURUSD if you guess market movement correctly. No, on gambling you should use mathematical possibility and gambling is not predictable at all. But Binary options symbols are Forex trading symbols and all financials markets are predictable if you have enough knowledge to analyze markets behavior. How can you gamble on Binary Options or Forex market too? It’s your choice whether you like trading by chance or knowledge. As you can see the CloseOption web platform is very easy and simple. When Am I Ready for Binary Options Real Trading ? The answer is very simple, you are ready when you earned profit on your demo account. Don’t trade fastidious. Get instant delivered access to _link has been removed_ our exclusive library of one-on-one training courses, tutorials in HD video and the same software used by the top traders all over the world.